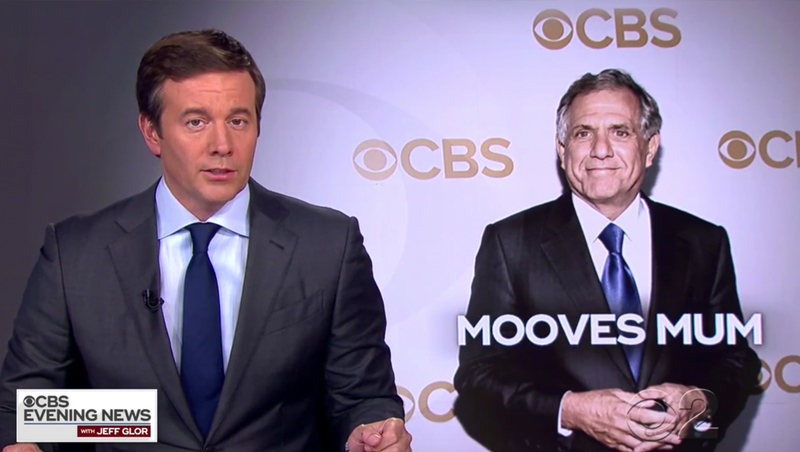 The “CBS Evening News” took time to address the elephant in the room on its Thursday, Aug. 2, 2018 edition — the sexual misconduct allegations against CBS Corp. CEO Leslie Moonves — but misspelled his name. “Evening News” covered the story about 12 minutes into the broadcast, with a photo of Moonves in front of a step and repeat on the video wall behind anchor Jeff Glor on the broadcast’s first feed. Meanwhile, “NBC Nightly News” didn’t cover the story Thursday evening while “ABC World News Tonight” put the story, like CBS, at about 12 minutes in.